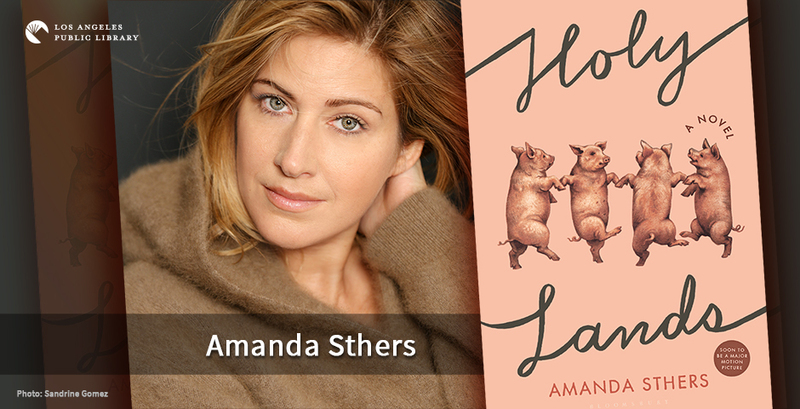 Amanda Sthers was born in Paris and now lives in Los Angeles. She is the bestselling author of ten novels, and her debut English-language film, Madame, was released in America in 2018. The French government has named her a Chevalier (Knight) in the Ordre des Arts et des Lettres, the highest honor it bestows on artists, for her significant and original contributions to the literary arts. Holy Lands is her first book published in the US and she recently agreed to be interviewed about it by Daryl Maxwell for the LAPL Blog. What was the inspiration for Holy Lands? I read an article in a very serious French newspaper explaining how to raise pigs in Israel. For once, Muslims and Jews were agreeing on something or more precisely against the same thing. I found the paradox hilarious, it was the starting point. Why did you choose to tell this story through letters rather than a traditional novel? I felt that letters would give a sense of immediate promiscuity and help us enter into a very personal story. Also, in a dysfunctional family like the one I am describing, silences are as important as words and only letters could give this feeling. I think we all instinctively hear what is left unsaid. Not really. But the major difficulty for me was to write it in another language than mine. I always wondered how writers could do it and now I understand that it helps you be more precise and accurate. Are Harry, Monique, David, Annabelle or Moshe inspired by or based on specific individuals? There is a little of me and my family in all those characters. Nothing direct or obvious, but the sense of a family is the same for all of us… We are not free to be who we want to be, we are building ourselves for or against our family, never with neutrality. Through your characters, you make both some rather pointed and lovely observations about both the Israeli and Palestinian peoples. Do you think there will ever be a workable resolution for both sides? I really wish that the young generation will find a way but it’s a Utopia. If they stop looking at the past and asking themselves who is wrong or right and just decide to move on, maybe? The Universe is in Your Hand, by Christian Galfard, an astrophysicist that used to be Stephen Hawkins’ student. A way to understand black holes and the big bang when you are very bad at science like I am. As a child, it was The Witches by Roald Dahl. I read it to all my brothers and sisters, trying to scare them off and spotting witches all around with them. As a teenager, I loved, I Spit on your Graves, by Boris Vian. I read it a bit young and it was a strong emotion to discover some very sensual scenes. Boris Vian, Jonathan Safran Foer. As a French girl it was hard to admit that I couldn’t go through Proust… It took years before I finally read In Search of the Lost Time and appreciate it. Some books must wait for you as you must wait for some books. Alice’s Adventure in Wonderland by Lewis Carroll. It helped me understand that I could make something incredible with the strangeness I felt inside. Yes. It’s supposed to be a children book. It’s my favorite gift… It’s called I Can’t Wait, by Serge Bloch, and it contains the entire essence of life. The strength of books is that you always read them for the first time. Books are alive because the effects of words and situations are changing as we do. A new novel, as always. But also the adaptation of one of my French novels, Les Promesses, to direct it as a motion picture.